It's playoff time in the MLS - find out which teams are involved, who the favourites are and of course betting tips and picks for every matchup. The MLS Playoffs feature the top six teams from each of the Western and Eastern conferences, and the final rankings in the regular season play a huge part in determining each club’s potential success. 1st and 2nd place in each division earn a week off in the first round, while there will be two elimination matches featuring 3rd vs 6th and 4th vs 3rd. From there, the conference semi-finals and finals will be a home and away tie that will be decided on aggregate goals. 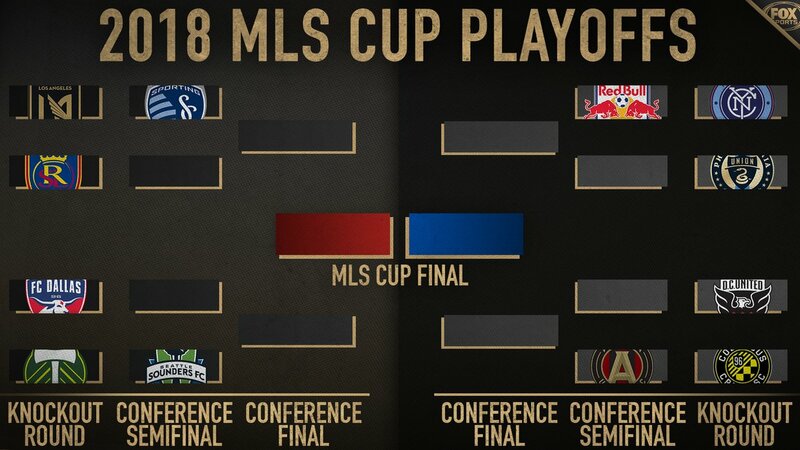 The winner of each conference final will progress to the MLS Cup final, and this match will be hosted by the participating club with the better regular season record. Remember that all stated odds are based on the head to head result at the end of 90 minutes. That means that the draw is still a potential outcome. Look further into the matches to find ‘draw no bet’ lines if you want to eliminate the possibility of a tie ruining your wager. Here are all the matches from the knockout round. New York City know how to make it to the playoffs – they finished second in 2016 and 2017 and are once again one of the top teams in the Eastern Conference. Their problem is that they can’t seem to find form at the right time of year, and have seen two postseason campaigns fall by the wayside. This year could be different though. Unlike the last two seasons, New York will need to play an elimination final to progress, and that could be the type of match that kickstarts a shot at the MLS Cup final. They will go into this match with plenty of confidence seeing as they just defeated the same Philadelphia Union team at home. While The Union did lose their last two regular season matches, they had only lost one of their ten games prior to that, doing enough to secure a place in the playoffs. Perhaps it was their plan to analyse NYC ahead of their elimination match? Either way it’s going to be a tough place to come and win. You have to go with NYC here, and the odds are in their favour – they start at -123. Wayne Rooney has made a huge impact in his debut season in the MLS, and it’s unsurprising to see D.C. make the huge leap from last place in 2017 to a playoff berth in 2018. United are also the form team in the competition having been undefeated in their last ten matches (7W, 3D). The big shift in momentum came when United moved into their new home in the USA capital – their numbers at home are staggering compared with their away form. Columbus are seasoned playoff participants, although they will really need to be on their game if they want to progress to the semi-finals once more. It is concerning that they haven’t won an away fixture since the end of July, and have lost seven of their last ten on the road. That’s enough to convince us that home-field advantage will be the difference here, and D.C. will advance. The draw looks to be a favourable pick according to the leading sports betting sites (+248) but we think they can do it in regulation time. Los Angeles have done well to finish third in their inaugural season, and will host Real Salt Lake in their first postseason match. We can’t believe that RSL have snuck into the top six again, having done so with a shocking goal difference last season. Yet they’re here and will provide a test of sorts for the newcomers. Despite the overwhelming favouritism, we are wary of LA here. There are a lot of similarities between this season and last – it was of course Atlanta United who were the new boys, and they finished third as well. As history will tell us, United were unable to hold it together in the playoffs, and they succumbed to a 0-0 draw at home before losing on penalties. It might seem like a stretch, but the postseason can often be won and loss on experience, and RSL’s trip to the playoffs last season may give them a fighting chance. We’re going against the bookies and tipping the draw here, which is paying generous odds (+322). FC Dallas blew a golden opportunity to finish atop the Western Conference standings, winning just one of their last five matches and losing their last three to hand Sporting Kansas City and Seattle Sounders automatic progression to the semi-finals. They host a Portland Timbers side who are in almost equally indifferent form heading into the playoffs. Both matches between the sides in the regular season resulted in draws, and there’s a strong case that this one could also finish level at the end of 90 mins. FC Dallas have a terrible record in the playoffs, while Portland finished 1st last season but couldn’t get past Houston in the semi-finals. We’re going with another drawn match (after 90 mins), and the odds are quite good at +295. The New York Red Bulls and Atlanta United are the teams to beat if the outright odds are to be believed. Both teams enter the first week of the playoffs at +333, and this is unlikely to change too much before they learn their playoff opponents. Interestingly, Seattle Sounders are well down on the list of potential MLS Cup winners, priced at +1400. For a team that has been there in 2016 and 2017, you could do worse than to pick them. The leading Western teams are Sporting KC and LA FC at +1000, although be wary of the latter’s inexperience in MLS Playoff games. D.C. United are also at a tempting price – you can jump on them at +1600. This Sunday November 11th, the CFL playoffs kickoff. The Ottawa Redblacks and Calgary Stampeders have earned 1st round byes while this weekend the BC Lions will face the Hamilton Ticats and the Saskatchewan Roughriders will play the Winnipeg Blue Bombers to see who advances to the conference finals. The Wildcard games have concluded and the 4 Divisional matchups are set. Red Sox, Yankees will have the most marquee appeal but all series are intriguing and this postseason lineup of baseball looks as good as any that can be recalled in recent memory. NBA players have the soul of a hip-hop artist. While they’re not playing ball, training or living life like a Rockstar they’re out producing rap albums or dissing other players. These ten NBA stars put out some cringe-worthy rap efforts.